These Silver 1 oz Dragons are true treasures: crafted to perfection and boasting an image of the most sought-after sign of the Chinese Zodiac with an exclusive privy mark of the majestic Bavarian Lion. 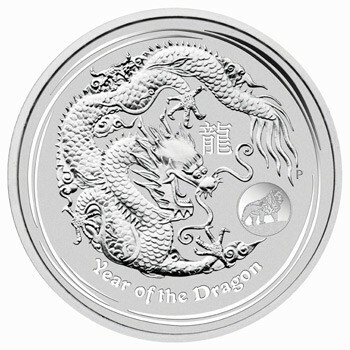 2012 1oz Silver Lunar Dragons have a limited mintage and are retailing anywhere from $75-$125. These limited edition privy Lunar Dragons have a much lower mintage capped at 200,000 units worldwide and offer an even more attractive opportunity for capital appreciation. The Perth Mint is world renowned for its superior minting technology, and creative handcrafted designs. Custom-minted and selling out fast, these coins are a prized item in any collection. Available this year only. Get them today or wait another 12 years for the next Year of the Dragon! Just Two Million of these Limited Lion privy bullion coins were minted.